Today was the day that we were heading back to Auckland to begin our exploration of New Zealand’s North Island. We had already used up well over half of our vacation in the South Island and were reluctant to leave because we loved it so much. The South Island of New Zealand is a magical, beautiful place that is a true outdoor enthusiast’s heaven. We could have easily stayed there forever but of course had to get back to reality and move on. Our flight from Christchurch to Auckland left bright and early which was a good thing because we really didn’t leave much time to spare in our itinerary. We arrived at the airport, proceeded to gather our luggage and rental car, and then were off once again heading North to Lake Taupo, in the central north part of the island. The drive was as beautiful and serene as we’d come to expect with New Zealand. Honestly, we were getting quite spoiled. Yet, the surrounding landscape of the North Island was quite different than the South Island which made it all the more pleasurable. The major reasons behind the differing landscapes has to do how each island was formed. The North Island was formed by volcanic activity whereas the South Island was formed by glaciers. As you can imagine, the terrain is vastly different. While the South Island is lined from north to south with the snow-capped mountains of the Southern Alps, the North Island is graced with extinct volcanoes, geysers, hot springs and less lush vegetation. It is more rugged and raw while the South is more lavish, green and majestic. The stark contrast between the two islands make it a necessity to visit them both. The drive to Lake Taupo took a little under three hours and we timed the drive so we could play a round of golf upon our arrival. 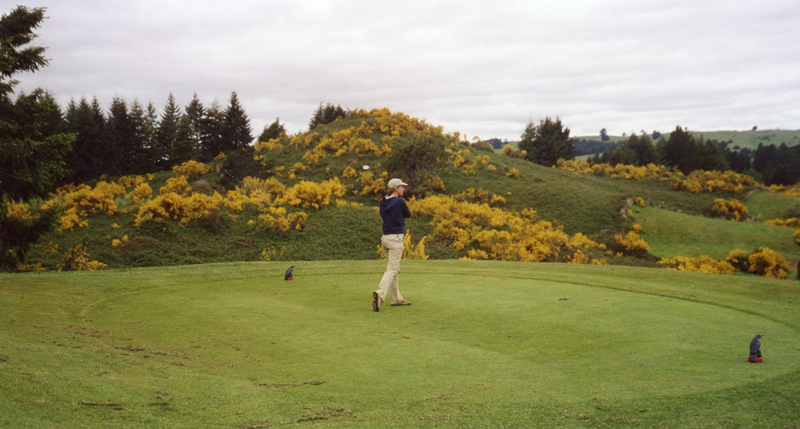 With the exchange rate being so incredible (this was 2002 remember), we were able to play the Waikai International Golf course, rated in the top 20 in the world at the time, for only $50 each! Although we were both out of practice, we still enjoyed the challenging course and I tried not to get too incredibly frustrated by how poorly I played. The sky had turned gray and overcast yet at least it wasn’t raining. We arrived at our B&B “The Loft” which was located outside the town of Taupo around seven o’clock and were pleasantly welcomed by the owners Peter and Grace. The B&B was outstanding and by far the nicest one we had stayed at during our trip thus far. It had only three rooms and felt more like a house than an inn. Our hosts Peter and Grace were wonderful and a tremendous help. You’re in New Zealand. You’re at a great place, with a great guy. So why don’t you just relax. Here’s a bottle, on the house. Then he gave me a wink and left. Wow, I tell you, did that make my night. I could never imagine a similar scenario playing out at home in the US. I loved the laid-back, carefree life of many New Zealanders. I wondered why I had fallen into that American trap of worrying too much about everything and not just letting go. Ahh…I wish I could live in New Zealand! We had an excellent dinner at Nannie’s, right on Lake Taupo. The wine flowed steadily, the conversation was light and hearty and I learned a valuable lesson that night. That sometimes it is time to stop and smell the roses. Otherwise life will just pass you by. Stay tuned…Next post: Our big day! We are scheduled to rise before dawn to do the eight-hour Tongariro Crossing hike. It is rated one of the top hikes in New Zealand! When I was little I thought that Lake Taupo was the ocean – I love being there in the winter, on a clear day, when you can see the mountains in the distance and the air is so crisp that it bites. PS Where we holiday – on the East Coast, about two thirds of the distance between Napier and Gisborne, you can have a round of golf for $5.00 NZ!! Ohhh…that is amazing! What is the name of the course? My parents go to golf frequently and I can pass it on to them. Mahia Beach – could be $10 now (tee hee), haven’t been since we had number 2.